The touchdown of flight BA2043 at Colombo Bandaranaike International Airport at 1235 hrs (LT) local time marked the successful launch of British Airways' newest long-haul route to Sri Lanka. 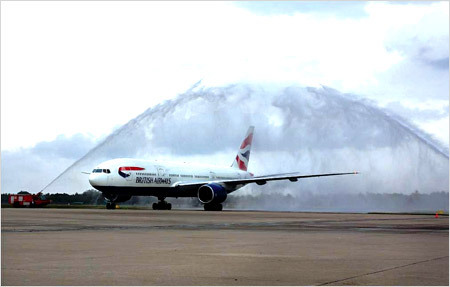 A water salute from fire trucks greeted British Airways' Boeing 777 aircraft marking the airline's grand return to Sri Lanka after 17 years. Economic Development Minister Basil Rajapaksa and Sri Lanka Tourism Promotion Bureau Chairman Bhashwara Senanka Gunarathna along with other senior officials were present at Bandaranaike airport for the inaugural betel leaf ceremony and a traditional dance performance. British Airways Chief Executive Officer Keith Williams along with his lovely wife and a crew of British Journalists checked into The Kingsbury Hotel at approximately 2.45pm on Monday. Mr. and Mrs. Williams and the British Journalist crew were warmly welcomed by Hayleys Group Chief Executive Officer/Chairman Mohan Pandithage together with The Kingsbury Chief Executive Officer Otto Stohl and well specialized staff of the hotel. 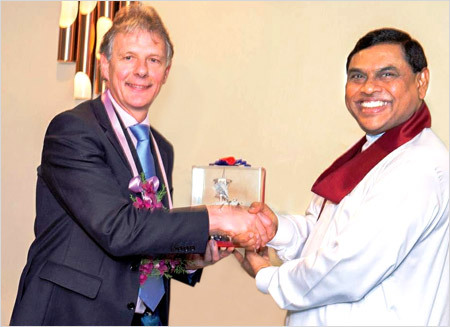 A token of appreciation from Minister Basil Rajapaksa to Keith Williams. The British journalists were captivated by The Kingsbury's signature features, while commenting on the remarkableness of the hotel. Mr. and Mrs. Williams were delighted with the warmth and hospitality offered by the hotel and its staff. 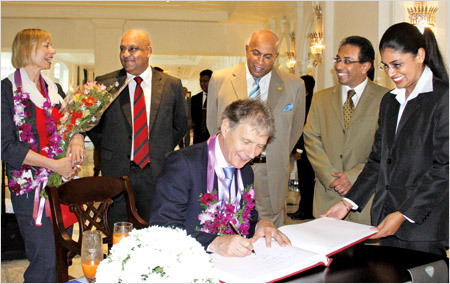 The hotel's esteemed guests from Britain ensured a return to Sri Lanka, as well as to The Kingsbury, to enjoy a 'timeless' experience. "With the arrival of our flight BA2043 today and our return to Colombo, we celebrate an exciting new chapter in our commitment to increasing our presence in South Asia. We see tremendous opportunities coming from Sri Lanka with more customers wanting to travel to and from Sri Lanka for both business and leisure. We are delighted to reopen our long-haul route between Colombo and London Gatwick today and look forward to enhancing the travelling experience of our customers from this market," British Airways CEO Keith Williams said. Starting today, British Airways' B777-200 aircraft will be operating three times a week between Colombo and London Gatwick via Male. The flights will operate on Monday, Thursday and Saturday with a three-class configuration offering flat beds in Club World, our premium economy, World Traveller plus and World Traveller seats. British Airways has introduced an attractive offer on return fares between Colombo and London and this exclusive offer is available for sale until April 21 for outbound travel period till July 31.